We're continuing our summer vacation (1900-style) with a view of the very prim and proper Boston Gardens. It sure didn't look like this when I lived there. Darn, seeing these sure makes me wish I had our old ones. But, I would probably wonder where in the heck to store them. 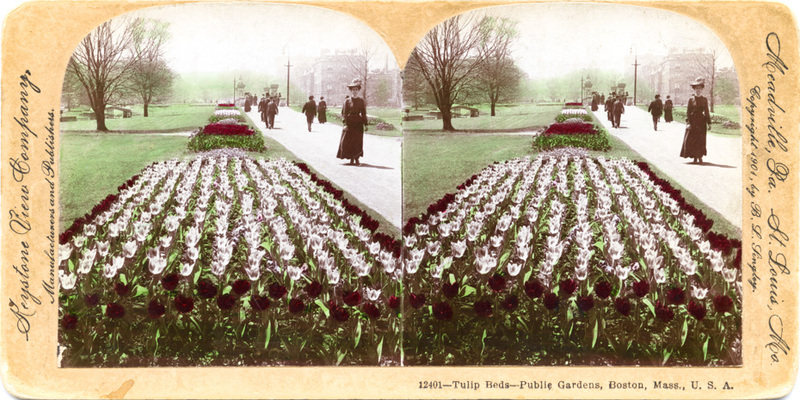 The tulips haven't changed much. The attire certainly has. We occasionally pop into antique stores looking for stereo cards of the Gorge and other PNW cards. You can also find some on eBay. Just checked and there are quite a few if you search Columbia River Stereo card. While doing that, a recommended sale referred to a "new" map of the Gorge from 1931. It is actually a reprinted map. The original scan in on-line at the Library of Congress https://www.loc.gov/resource/g3701pm.gct00064/?sp=173&r=-0.261,0.525,1.977,1.001,0 pre-Bonneville Dam, pre-SR14.